An Asian theme and new features are in store when Houses 2 and 3 at the Buffalo and Erie County Botanical Gardens finally reopen after extensive renovations. The goal is to have the buildings open to the public on Jan. 14, said David J. Swarts, president and CEO of the Botanical Gardens. The tall waterfall in House 3 will be back with a different look. 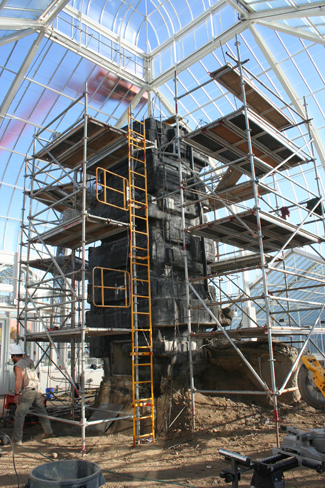 The old waterfall had a Mayan feel to it, and that wouldn’t fit in with the new Asian rainforest theme, Swarts explained. The new version will look like a sandstone outcropping that you might see in the Yangtze River Valley. A couple new hardscape features that reflect the Asian theme are a moon gate and a Japanese-inspired tea house. The moon gate, a huge, 12-foot stone circle, is a traditional architectural element in Chinese gardens. 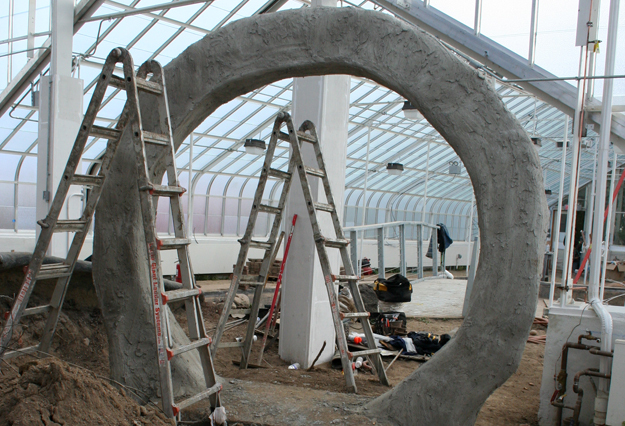 A moon gate is a circular opening in a garden wall that acts as a pedestrian passageway. The tea house is a decorative element, not a place where you actually drink tea. It will help the staff talk about Japanese culture, be used in displays and serve as a photo opportunity for people attending weddings and other events at the Botanical Gardens. In House 2, the theme is an Asian aquatic garden. It includes another new exciting hardscape feature: a free-form water feature that’s five feet tall and 11 feet long. Water rushes down into a pool. “It’s one of a kind,” Swarts said. The koi pond is returning with a new footbridge. While the exhibits aim to evoke an emotional response for visitors, they are meant to be educational as well, and there will be new signage to inform visitors about the exhibits. The plants in the garden beds are native to Asia and include nine varieties of bamboo. There will also be many varieties of orchid, and the bonsai collection will be located in House 3. When you visit for the first time, remember that the garden beds in the exhibit will be brand new in January, Swarts said. The renovation work, which is being done by Erie County, started in May 2015. The houses were closed for the extensive repairs that included repointing of the exterior and interior masonry and brick; steel and wood refurbishment and replacement; glazing work and glass replacement; heating system repair and replacement; temperature and humidity sensor updates; electrical updates; misting/fogging system repair and replacement; emergency system updates, koi pond and waterfall repairs; new lighting installation; painting of the interior and exterior, and complete finishing work. 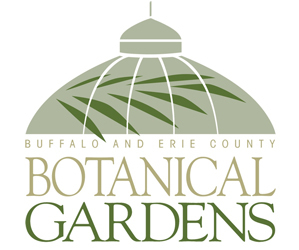 The exhibits are being created by the Buffalo and Erie County Botanical Gardens Society, Inc. It will be nice. I was wondering about how long it takes for the plants to be established, but I am guessing they will grow fast in that humidity and temp. I can’t wait! This long-awaited re-opening is a week before my birthday, so for me, it will feel like an early birthday present. Gardeners take note–The Botanical Gardens is willing to open to public viewing even though the exhibit is not mature. So often gardeners are reluctant to participate in garden walks because their garden is not good enough yet. I love seeing the progress that gardens make over time. 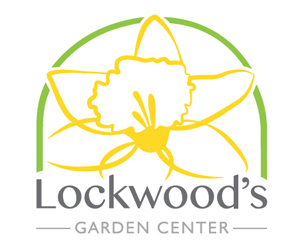 Linda, I do encourage gardeners to share their landscapes on their local garden walk. Their landscape will never be perfect; no one’s ever is. And people do like seeing works in progress. They like to get ideas for their own landscapes and are eager to see how other people are tackling challenges.